Can you trigger it's ability even if your opponent doesn't control any characters? It doesn't say "if able," so I think not. You can't just use the Temple to sacrifice one of your own green guys with no further effect. You're targeting the player though. You can "Choose an opponent" regardless of whether they control a character or not. 1) Action is initiated After a player initiates an action, the timing window starts. For the initiation stage of any player action, a player must go through the following sub steps, in order. The first step is always revealing the card or declaring the intent to use an ability. a) Determine the cost (to either play the card or pay for the card’s effect) or costs (if multiple costs are necessary for the intended action). b ) Check play restrictions, including verification and designation of applicable targets or cards to be effected. d) Apply any other active modifiers (including reducers) to the cost(s). f) Play the card, or trigger the effect, and proceed to step two. As such, because the opponent has no characters that can be sacrificed, you wouldn't be able to trigger it. As for CotD, the issue I have with Temple is when it is compared with Khopesh, for obvious reason, and whilst Toughness and Invulnerable weaken Khopesh, the ability to target which character to hit with it is the big swing in it's favour for me. If your opponent can get a reasonable board out, or at least play disposable characters, Khopesh wins over Temple every time. However, when combined with cards such as Sibilant Cry in a Serpent deck, then you can outpace most decks. Likewise, Foul Induction and a steady supply of green Cultists feed the Temple admirably. 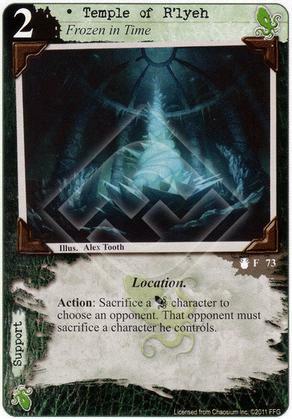 Yes you may sacrifice a character to Temple of R’lyeh even if your opponent has no character to sacrifice, since the direct effect of your sacrifice is to choose an opponent, which you can successfully do. The following contingent effect fails, but it is not required for the first part of the ability. Also in regards to Khopesh, yes, targeted removal is better in many cases, but attachments have their issues as well. I.e. you put a Khopesh on your Innsmouth Troublemaker, and your opponent plays Pushed, Deep One Assault, Small Price to Pay, etc. Now you've just lost two cards that cost 3 resources to play for your opponents 1. Imho, the key is that it's two separate sentences, so the targeting is successful if the first sentence can be fulfilled. Oh, and the Temple is obviously great, especially in Cultist decks. It's one of the cards that can hurt you pretty bad if you don't have an event for support destruction (or some kind of protection from either support cards or sacrifice effects). At least it's a Location, making it more vulnerable and an invalid target for Flooded Vault. Initiate of Dagon and Foul Induction make the Temple completely terrific. I mean, Foul Induction can get you, what, six in-faction cultists into play from your discard at one swoop? And presumably you Temple-sacrificed most of them in the first place!